A card sorting activity (and cookies) to co-create product features with end users. Off Grid Electric(OGE) offers scalable “solar energy as a service” to customers living with kerosene lamps. By building their own distribution networks, they are able to reach last-mile customers with their solar-powered appliances coupled to intelligent software and a mobile money payment structure. Catapult Design was hired by Off-Grid Electric to redesign the mobile app that OGE’s network of agents use to sell and install solar home systems in off-grid villages throughout Tanzania, where 86% of the population does not have access to electricity in their homes. The challenge was designing an Android app to run on low-cost smartphones and used by a team of agents with little or no prior experience using a smartphone. The app helps agents track their performance (leads, commissions, etc.) and provides tools to help them support customers (payment wizards, troubleshooting guides, etc.). We conducted contextual interviews in the home of customers. In this photo, a father shows us the kerosene lamp his family uses when his solar home system is not functioning. Our team from Catapult Design led a two week research study in Arusha, Tanzania understand how OGE's network of agents sell and install solar home systems and how they can be supported by digital tools. Through shadowing agents and contextual interviews with customers and stakeholders in the supply chain, we mapped out the distinct steps of the journey that agents and customers take from meeting for the first time through system installation and we identified pain points that impact OGE’s goals to scale. The output from this phase of work was a journey map and "opportunity cards" that corresponded to different stages of the journey. With these tools, stakeholders at OGE could be empowered to lead their own ideation workshops and identify solutions outside the context of the agent smartphone app. We used low-fidelity wireframes to present 5 interaction models to the client. 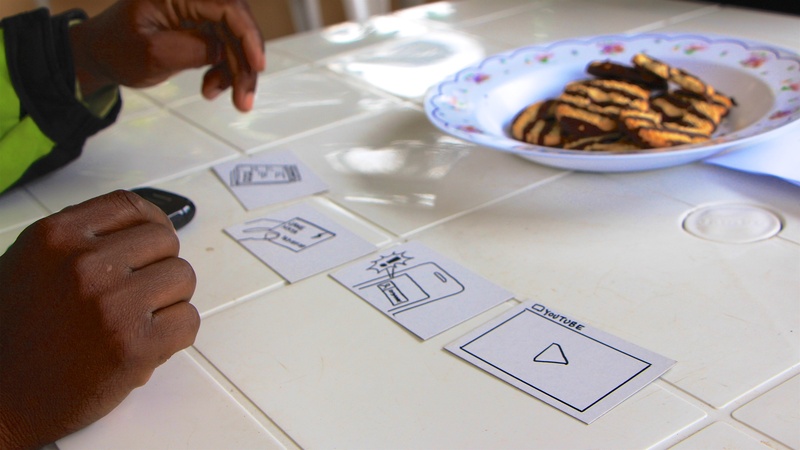 We used low-fidelity wireframes to present 5 interaction models to the client and chose 3 to develop into interactive prototypes that the client team tested with agents in Tanzania. After narrowing down to 3 models, we created click-able prototypes and a prepared a “Prototyping 101” guide to help facilitate the prototype testing process. Based on feedback from the prototypes, we identified a “winning concept” and developed wireframes and visual design comps that the client could hand off to their development team. The team from Catapult Design consisted of a Project Lead, User Experience Lead and Visual Design Lead. As the UX Lead, it was my responsibility to plan and conduct user research in Arusha, Tanzania, develop interaction models, click-able prototypes and prototype testing protocol and design the final wireframes and UX guidelines.